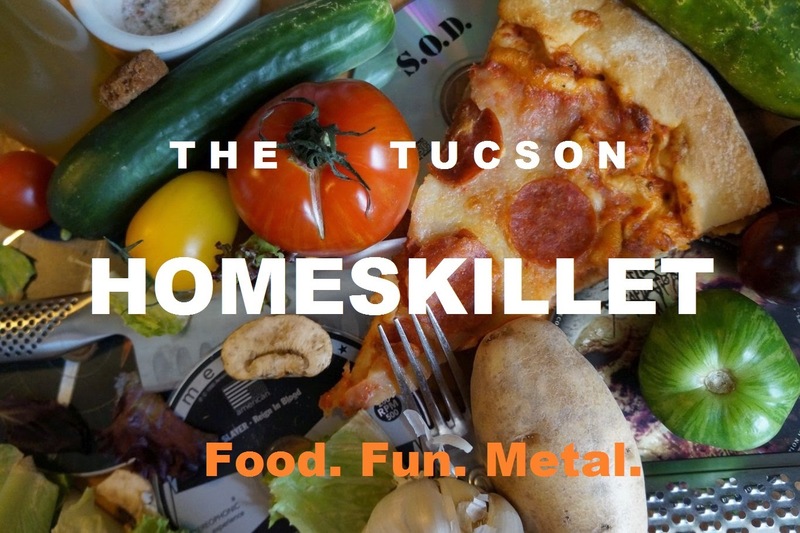 The Tucson Homeskillet: What's That Smell? Oh, It's Romance In The Air! It's that time again Homeskillet fans. Time to get snoogy woogy with your bestest love muffin, dole out perforated cards stating pre-drafted sentiment like "Use the force...and be mine!" and above all spend your hard earned dollar on big plush bears, dyed pink, scented like roses with doughy wet eyes holding a heart that says "I Wuv Wou!" That's right! It's Valentine's Day and we at the Tucson Homeskillet are all about romance. We love food. We love booze. 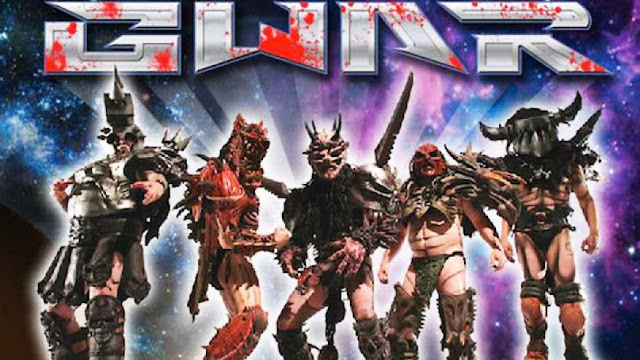 We love Metal. And...uh...well I'm sure there's more to life but at the time being we can't really think of anything else. 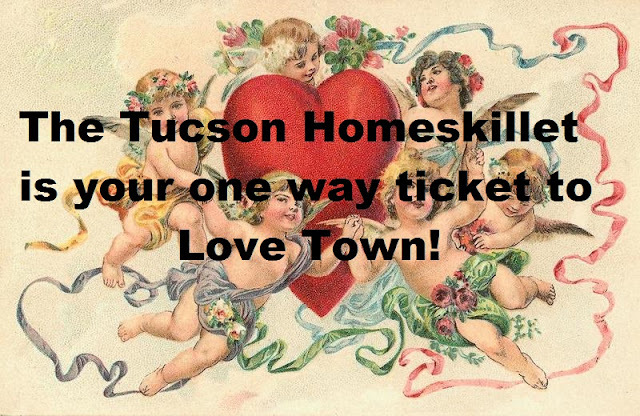 That said, the Tucson Homeskillet is here to help those that are stuck on what to do to court that special someone. 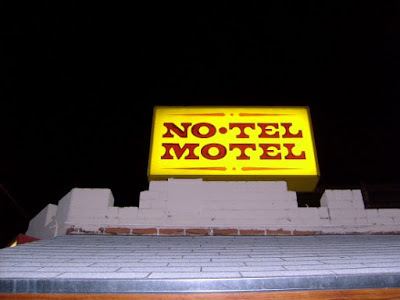 It's not widely known, but Tucson is the romance capital of, um, anywhere between Phoenix and Nogales. Betcha didn't know that did you? Well...now you do! Yes, this fine city is chock full of enchantment and beguiling charms of the heart. In fact, the word Tucson comes from the native people's word for "city by the hills" and history has shown those hills were the curvaceous rump of a lovely O'odham lass named Becky who was the peach in a missionary named Rondor's eyes as he killed her family because they did not believe in Jesus. Afterwards, he put beans and mayo on a hot dog and, well, the rest you know. So here are some things we came up with to get yourself magically whisked away into a incandescent rainbow colored tsunami of love and unplanned bulges as young hearts race and long term marriages begin to go through that "should we try something...weird...to make this work?" phase of their commitment. Yes, let us guide you into the thudding abyss of silk sheets, scattered flower petals and some hitchhiker named "Cody" and wiggle down the choo-choo tracks of lust and questionable charges on your credit card. You ready? 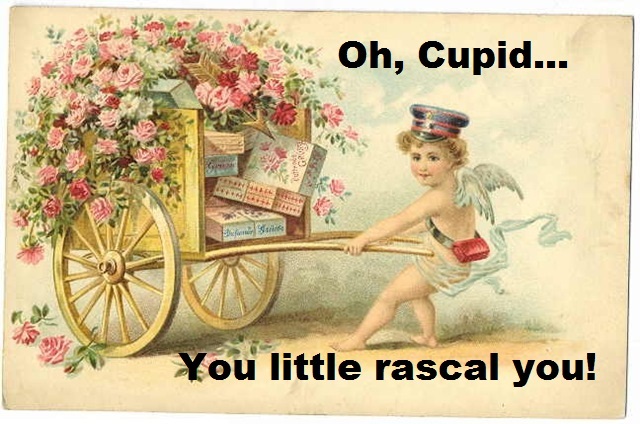 Well bend over Methuselah because here comes the cupid juice! When you walk through the door you and your valentine will be suddenly transported into another world. Bask in the glory as the local elders take in heaps of steamy "food" and cram it down with bottomless ice tea refills all the while getting confused by the sneeze guard. The look on the servers face alone with tell you what's on their mind: They're not in it for the money, oh no. They are in it for the excitement of it all, the occasional "Thank you sweetie" and waking up grandpa Jack when he goes face first in the pea soup. 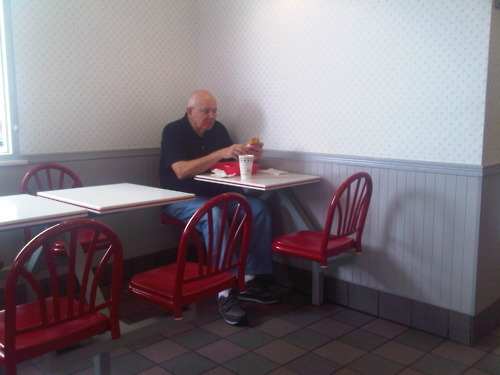 It also helps if you play old Tom Waits while eating and looking at the single seniors sitting on naugahyde and enjoying 1950's inspired cuisine. It makes for lovely cabaret. 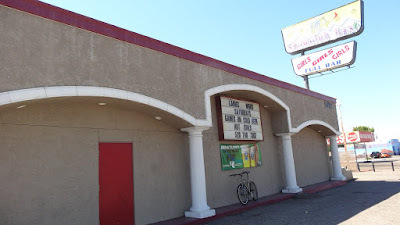 Nothing says "Oh la la" like vintage neon signs, bowling alley churros and a $9 prostitute wearing a neck brace. 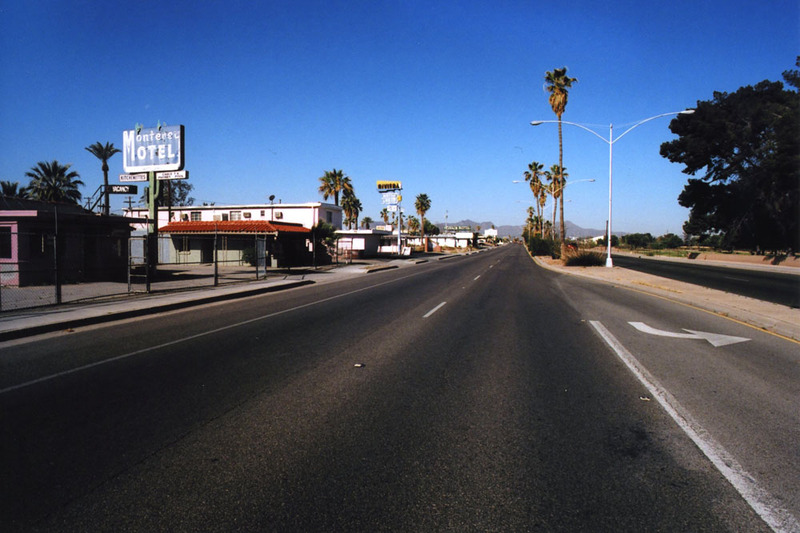 Yes, Miracle Mile is a lovers stroll down the city's history. Just take it all in. No really, just lean your head back and breathe in deep. Quite pungent isn't it? That's decades of frolic and antics from yesteryear. Sure there's the refurbished Monterey Court with it's newfangled shops and fruity art galleries along with that hoity toity cafe of theirs, but that's not what you're looking for, right? No! You're looking for an authentic Tucson adventure to ease your date into a state of wonder followed by a woozy foray that could almost be described as "straight roofied". Might we suggest taking a tour of the historic Ghost Ranch? We might. 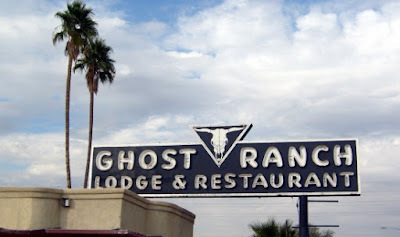 These days it isn't a ranch at all. In fact it's better than a ranch. It's an apartment complex! Think about all the fun you kids can have by just knocking on doors and making new friends! It's like an instant Valentine's Day party. All you gotta do is knock, introduce yourselves, walk right in and help yourself to whatever is in the fridge. Perhaps going through their medicine cabinet can be the start of a muy romantico evening. What's that on the TV? A 'Criminal Minds' marathon? I say it's time to sit down on that couch with your new apartment pal, kick back and enjoy. Maybe slowly put your arm around your date as the man in the brown terrycloth robe phones the authorities. Smooth move there Don (or Joan) Juan. It's time to take in the local dance theater that is TD's Showclub. Ballerinas have nothing on these prima dancers, let me tell you. First of all, ballerinas don't glisten and shimmer with fairy dust, these ladies do. Ballerinas can't shimmy up and down a fireman's pole and do all sorts of Cirque du Soleil gymnastics as the dancers here can. And I'm sure ballerinas don't make that much money because these light on their feet fillies literally have cold hard cash thrown at them and all they have to do is become art models for a moment and sometimes wow you with their derriere dexterity. Really, it's quite the spectacle. One cheek goes this way, the other in another bouncy direction. Now that's talent! If you two love birds get hungry, nothing says "I've got a crush on you" like various chicken parts doused in Tabasco water, or "here's lookin' at you kid" much like hockey pretzels slathered in a fine duck butter glaze and served with a kiddie pool filled with cheese squirt, all served up by a lady that didn't make the dancer cut so now she cuts herself at night just so she can feel something. Yessir. 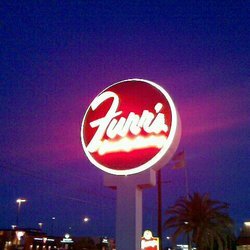 There's a bit of ol' Old Pueblo magic at TD's and when the coke raids start at midnight, you know your love will last forever. Plus there are plenty of places to sleep on Miracle Mile, when that time arrives (wink wink). For less than $20 you can rest your love soaked head down on some rubber matted sheets and enjoy the rhythmical pastorale of folks expressing their Second Amendment rights, enthusiastically and more often than you anticipated. You'll find it hard to beat saying "good night dear one" like an angry pimp trying to explain to his female employee that she has not provided enough payment for the evening and he is now just wondering where the other payments might be residing. The coo of her desperate pleas will inspire many cloud puffed dreams as your neighbors violently make love to one another and call out the name of our Lord whilst the rapping of their headboard offsets the almost Christmas-like lights from squad cars fill your room with the warm glow of sheer heart racing bewitchment. 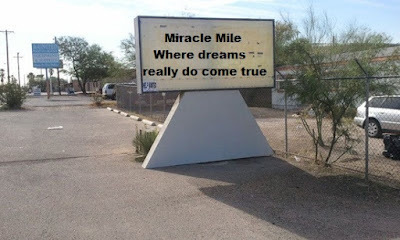 They don't call it "Miracle Mile" for nothing. The sheer benediction of this long stretch of road can only bring couples closer, reignite the passions of those long married and entice those that just locked eyes and know they will be together forever. And if that isn't a miracle...we don't want to know what one is. Except for that one drunk guy warbling Dire Straits down at karaoke night at Nevada Smith's Saloon some evening. That wasn't just a miracle. It was something else making angels weep. Hopefully he will be available to croon you two into marital bliss because only true love can follow Chad from accounting five-rums-in squelching "Man in the Mirror". Let his song be your drift into wedded rapture! Okay lovebirds, time for a nitecap. 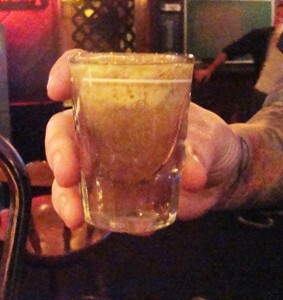 Shake the Rumple Minze and Four Loko together. Strain in a dirty glass you got at the swap meet. Top with the gravy. Serve and enjoy. And what is the name of this mighty potion of desire?